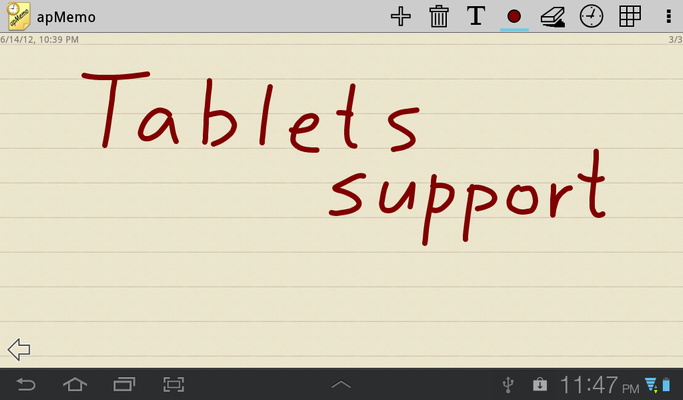 One of the best selling note-taking applications for Windows Mobile is available for Android! 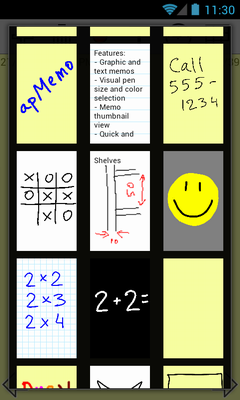 apMemo - is an amazingly handy, quick, small, and easy to use graphic notepad with well thought-out interface! Just open apMemo and instantly you are ready to take a note! 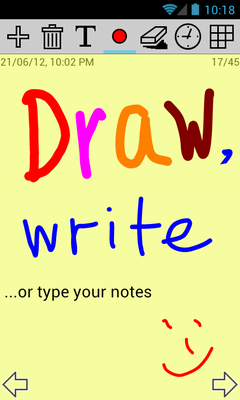 Simply jot down a handwritten note with your finger or stylus. Switch between graphic and text modes with just one tap. Draw over any image or photo. Write a checklist and mark the items or strike them out like you'd do on paper. Choose your favourite pen size, and color for the pen and background. Set a reminder with just a couple of taps. Move between the notes back and forth or use a thumbnail view to quickly switch to another note. 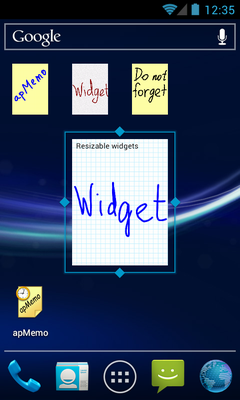 With apMemo widget put your memos on the Home screen, like sticky notes. apMemo is the simplest and fastest way to create quick handwritten and text notes and reminders! 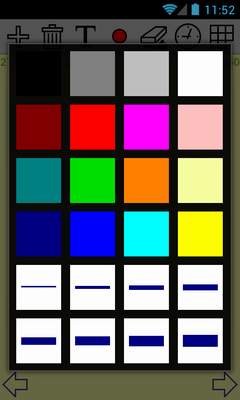 apMemo Lite is available for free on Google Play (Market link). You can also download it directly from here. All other important features are the same as in the full version. No time limit, no annoying advertisings! apMemo is available on Google Play (Market link) for only $2.99 USD! More information about apMemo, such as, how to transfer old notes to a new phone, can be found on the support page. - UI and stability improvements. First version of apMemo for Android is released! "Really simple to use and very useful. I have tried most of the 'post it note' apps and this is by far the best for quick notes and reminders. Very functional, simple and fun." "Dream app for Galaxy Note! Short, fast & sweet, it is sort of the scratchpad funnel of those simple notes that even the S-Memo app is too slow for. This app, on Android brings the functionality of Diddlebug & Bugme on Palm OS & apMemo originally developed for Windows Mobile. 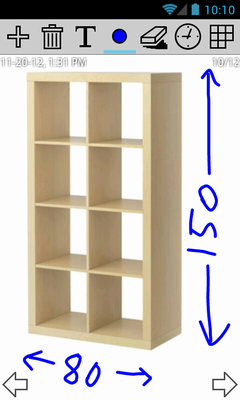 THIS APP ALONE is complete justification for buying the galaxy note!!!!! I'm leaving this review and off to get the paid version. Btw very robust in keeping data on sdcard so data is kept even if you uninstall/reinstall app." "Superfast & straight forward. Tap, scribble, tap - note saved, app closed. Excellent!" "Thank G-d! I've been waiting for this app for a year. Clean, simple, the only REAL note jotter w/reminder!" "Really good notepad! I recommend it"
"The best memo app I've found..."
"Best app ever! How did I go this long without it? So simple but effective." "Really easy to use. Reminder time selection UI is the best I've seen so far!" "The best feature of apMemo is its speed. With other "note" applications, it is frustrating when the screen draw lags behind. apMemo is very fast and there is no delay. Easily the best I have tried. I always buy apMemo when I purchase a new PDA." "...This little reminder/post-it program works very well. Odd that previous efforts have been so few. The closest I'd seen before was StopTime beta 2.0, which incorporated a similar scratchpad and threw in voice notes as well. But it was awkward to use, where apMemo is very fast and easy. Thank you for this fine program!" 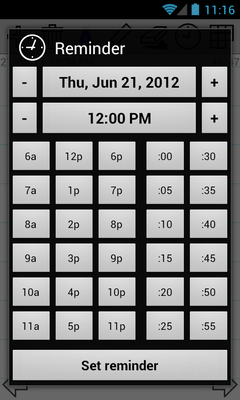 "...One of my favorite apps for PocketPC with a very simple and intuitive UI..."
"...Simple, very simple to use. Useful and fast. A "no problemo" product like every product should be. It does well what it is supposed to do. Thank you." "...I was searching since several weeks a hand writing notepad which is as simple as a paper one. I have tested a lot of them but they were too "ugly" to use or too complex for quick uses. I have discovered apMemo this week-end and it is THE soft I searched. Congratulations for your development and thank you!"